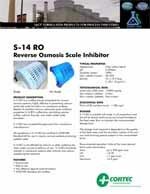 Description: S-14 RO is a multifunctional antiscalant for reverse osmosis systems, highly effective in preventing calcium carbonate scale formation on membrane surfaces. Besides its excellent calcium carbonate scale inhibition properties S-14 RO is effectively controlling calcium sulfate, calcium fluoride, and metal oxides scale formation. Package: S-14 RO is available in HDPE 25 kg pails and 250 kg drums.